New research offers a sobering glimpse into what it means to be out of work for an extended period of time in the U.S. – and the ongoing struggles of those long-term jobless to get back into the job market. According to a new national study from CareerBuilder, nearly a third of previously employed workers – people who've been without a job for 12 months or longer and are still looking for work – say they haven't had a single job interview during that time. Long-term unemployment has also left about 25 percent of those surveyed without enough money for food. Another 12 percent say they've maxed-out their credit cards to pay other outstanding bills, while one in 10 of those polled say they lost their house or apartment due to their inability to pay the rent or mortgage. Being out of work for a lengthy period of time also means relying on friends and family, and in many cases straining those relationships. Nearly 40 percent of people in the study say they've turned to their spouse or partner to help out with expenses, while 11 percent have asked their parents for financial help. Nearly a third are currently living off any savings they might have. 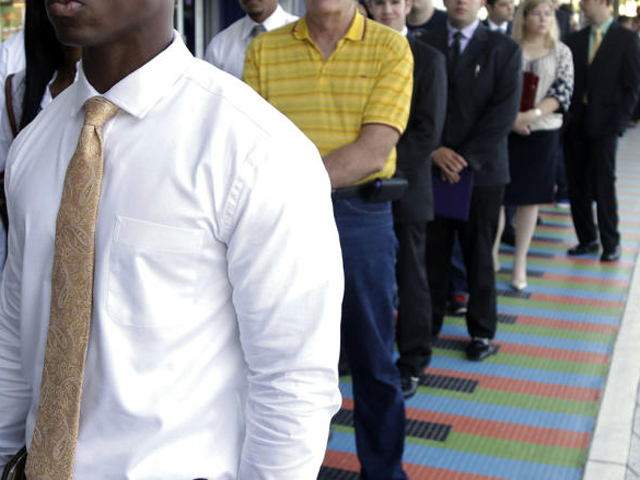 Even with the economy rebounding from the recession's lows, it's still hard to find work. Forty-four percent of long-term unemployed said they look for work daily; 43 percent hunt for a job every week. As previously mentioned, about 30 percent of those surveyed said they haven't had an interview since losing their jobs – but another 30 percent say they've had five or more interviews, with 14 percent having 10 or more. When asked why they were having difficulties finding work, many long-term unemployed (63 percent) felt a lengthy jobless period hurt their chances with potential employers. Among the long-term jobless ages 55 and older, two-thirds felt their ages or experience put them at a hiring disadvantage, while 92 percent said their age worked against them in the current job market. The CareerBuilder study dovetails with new research from the University of New Hampshire's Carsey Institute that finds the number of jobless workers seeking employment for over six months has more than doubled since 2007, and currently stands at over 39 percent. Researchers involved in the Institute's study say their findings are especially timely, as the national debate over whether to extend federal emergency unemployment benefits continues. "It is important to gain an understanding of the long-term unemployed in terms of their demographic and economic characteristics and how those characteristics differ across place,”Andrew Schaefer, doctoral candidate in sociology at UNH and a research assistant at the Carsey Institute, said in a statement. "Doing so can help better target strategies for alleviating the negative effects of long-term unemployment." A 16-year-old Sacramento girl met the transplant recipient of her dad's heart, and she was brought to tears as she listened to his heartbeat one last time.